A panel for the Peavey Spectrum Synth, a 1U multi-timbral rack unit. 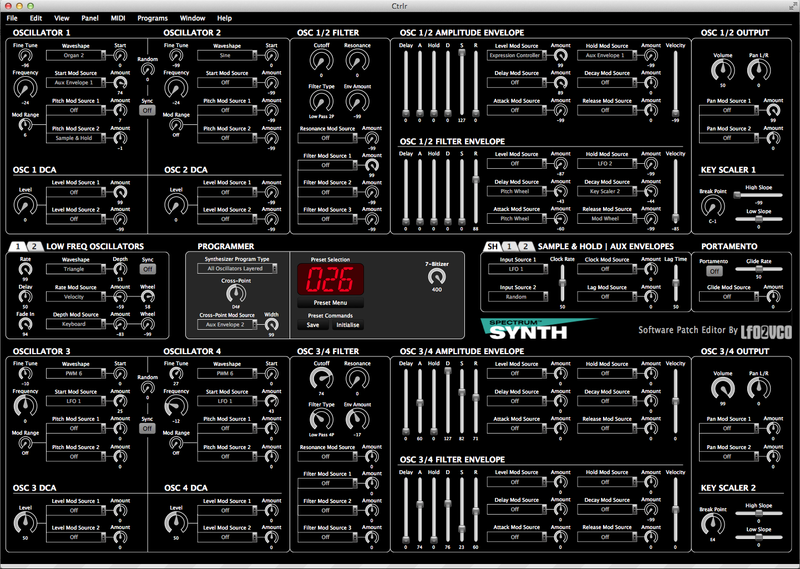 This panel uses Sysex commands to control the synthesizer parameters on Spectrum Synths running version 1.2.4 firmware. All patch parameters are accessible, however existing values are presently not displayed in the panel. You can easily select presets via the Preset Menu, save any changes via the Save button and start presets from scratch via the Initalise button. This panel was created and functions in Ctrlr version 1590. A panel for Roland JX-3P Synthesizers that have been retro fitted with the Kiwitechics 3P Upgrade (version 2.5 firmware). This panel uses predominantly Sysex commands to control the synthesizer parameters. The current patch name and location are displayed in the centre screen. Next to the screen are two buttons, these select the panel features via pop-up menus. The the Kiwi-3P menu allows the selection, saving and moving of patches in the synthesizer memory. The Editor menu allows patches to be renamed, initialised and saved to and loaded from disk as Sysex files. The panel was created and functions in Ctrlr version 1590.